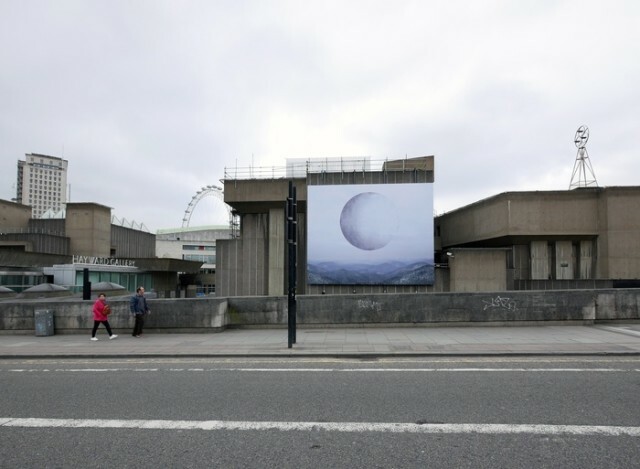 As the fourth of the Waterloo Billboard Commissions, Hayward Gallery presents Station II (2015) by Noémie Goudal, from her series 'Southern Light Stations'. In the centre of this image is a large disc, painstakingly constructed from tiled sheets of paper and suspended in front of a sweeping mountainscape. In this striking image – now situated in the busy urban landscape – Goudal explores the relationship between the manmade and the organic, and our enduring fascination with the sky. the Queen Elizabeth Hall Terrace, Level 2.